On August 6, 2012, Toronto cyclist Joseph Mavecs was riding his bike on St. Clair Avenue near Wychwood. He was riding without a bike helmet. He had a bag of groceries on the handle bars. As he was trying to make a left hand turn from St. Clair onto Wychwood, his bike tires became lodged in the exposed streetcar tracks on the roadway. Mr. Mavecs then flew off his bike, and hit his head on the pavement. He was pronounced dead at the scene. If you’ve ever rode a bike, or driven a car on Toronto’s streets south of Bloor, you’ll quickly notice a few things. Firstly, the streets are congested with cars, bikes, pedestrians, parked deliverly trucks, construction closures, road maintenance, poodles etc. You name it; Toronto has it. Secondly, you”ll notice that there are a variety of exposed street car tracks. These tracks are used by the TTC. Some lines have been out of service for a long long time. It turns out that the tracks which caused Mr. Mavecs to fall hadn’t been used by any streetcar, or by the TTC since 1978! How crazy is that! You would think that the TTC or the City of Toronto would have removed the tracks some 34 years after they had not been in service. I can’t help but think that the Mavecs family would not be mourning this wrongful death had the tracks been removed and covered up with ashphalt. 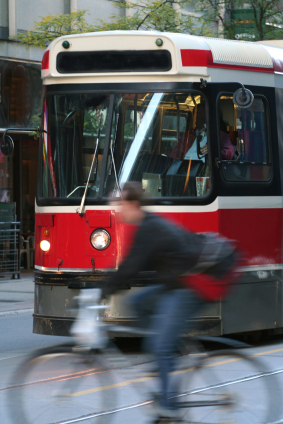 Editorial Note: The TTC still charges $3/fare. Compare that fare to New York City which charges $2.25/fare. Chicago charges $2.25/fare. Montreal charges $2/fare. All of those cities’ routes are more extensive, and they offer re-fillable fare cards with diverse payment options. Toronto is the most expensive, least expansive, and most draconian when it comes to payment options. But don’t worry Toronto TTC riders! Better payment options are on the way..I’m told (like 3 decades too late), and a new subway/LRT line is on its way (can’t wait. See St. Clair LRT Project). Would Mr. Mavecs have died at the scene of the accident had he been wearing a bike helmet? Studies show that wearing a bike helmet can save your life. Don’t take my word for it. Here’s a great website on bike helmet research and the lives they help save following a bike accident. Our law firm recieved a number of inquiries following this accident about what the family could do. What rights they have following this tragic bike accident. Well. If the family were to sue, it would be a very difficult case. There’s no issue about the damages. Mr. Mavecs died as a result of the bike accident, and likely trauma to his head/brain injury. The defence will likely argue that he was partially liable for his death/injuries because he was not wearing a helmet. In such a case, the defence will argue that any award ought to be reduced by Mr. Mavecs contributory liability or negligence for failing to wear a helmet. The defence will argue that Mr. Mavecs was in his own way, an author of his own misfortune. They will also argue that he was not paying attention to where he was riding his bike, travelling too fast, should not have gone over the tracks the way that he did etc. They will likely try to throw everything including the kitchen sink at him to sink his case. But that’s typical of an insurance company, even in a tragic case such as this. But more importantly is how the law works when you’re trying to sue the City or Municipalilty. First, the Municipal Act requires that notice of the claim be given in writing within 10 days following the date of the accident. Secondly, in order to sue the municipality, you must not just prove that they were negligent. You must prove something BEYONG negligence. The standard is gross negligence, which in layman’s terms is acting BEYOND BAD. It’s acting with a wreckless disregard for the safety of others thereby knowingly putting the general public at risk of harm. Courts in Ontario have held that Municipailities are not held to a standard of perfection. If they were, they would not be able to function. Asking a municipality to be held to such a standard would completely paralyze the municipaility from operating and going about its day to day affairs. Hence, the higher threshold of gross negligence to prove liability against a municipality. Does the fact that the streetcar track in Mr. Maveck’s case had not been in use since 1978 prove gross negligence? Probably not, but I’m no Judge. The Plaintiff would need to show that there had been previous accidents on the track before; along with previous complaints from other cyclists, pedestrians, or motorists. If the Plaintiff can show a pattern of injury or accident caused by this exposed track, it would certainly add to the Plaintiff’s case. If the City of Toronto knew, or ought to have known that this track was a safety hazard, and had caused injury before, then it opens the door in proving liability against the City. Still, not an easy case. If you want to read an article about this accident, here’s a pretty good read. Finally, congrats to the Canadian Women’s Socccer Team on capturing Bronze at the London 2012 Olympics. I disagreed with the officiating in the loss to the USA. But, Canada should never have given the Americans so many opportunities to win that game in the first place. Excellent job regrouping, and making our country proud. If Christine Sinclair isn’t the flag bearer for the closing ceremonies, then who? The lone gold medalist on trampoline would be a good choice too, but do we really want to encourage kids to jump around on trampolines? Do you know how dangerous they are? They’re the #1 cause of spinal cord injury and other injury in backyards across Canada. Check out this mommy blog talking about their kids breaking their necks at C4 on a backyard trampoline. Be afraid. Be very afraid.